Let me preface this post about our Sahara Desert tour in Morocco by saying that I despise signing my life away to anyone else managing my time for more than a few hours. As a child, this meant that I hated summer camp with the passion of a thousand fiery suns, and only made it through a couple of them (despite growing up to love most of the actual activities that campers participate in). As an adult, it means that I am deeply suspicious of organized group tours and generally avoid being part of them at all costs. So, when I say that Jeremy and I found that the final night of our 3 day/2 night Sahara Desert tour in Morocco to be the most rewarding thing that we did in the country–I really, really mean it. Should You Book a Morocco Sahara Desert Tour in Advance? Erg Chebbi, the giant dune that most tourists seek out when trekking to the Sahara in Morocco, is one of the most remarkable things I have ever seen. The complete silence that greets you in the desert, and the way you can truly lose yourself in sand that stretches as far as the eye can see, is incredible. 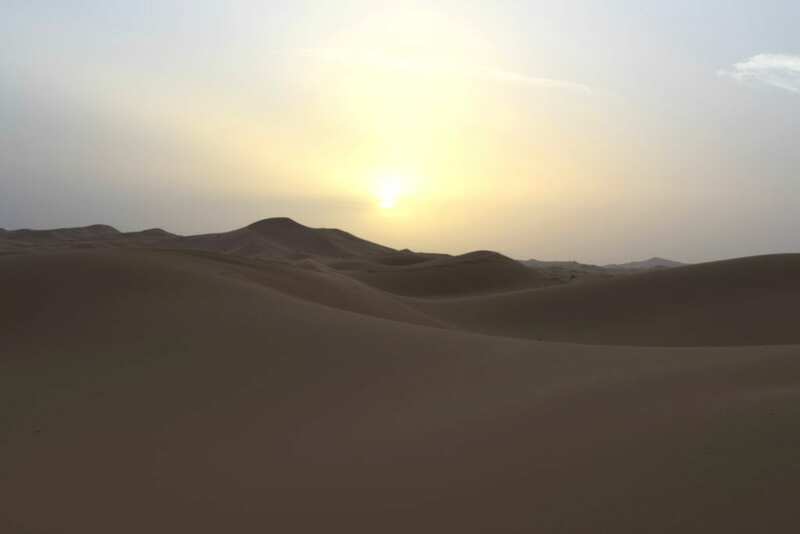 The sand in the Sahara Desert is the that softest I have found–no beach or desert that I have ever been to before can compare: this was akin to sitting on velvet, or running your hands through water. It is so soft. And, the stars–don’t get me started on the stars. I have been to some fairly remote places, but the Sahara Desert is about as dark as it gets: when the sun went down, the sky utterly erupted with more stars than I thought it could hold, complete with a crystal-clear view of the milky way. 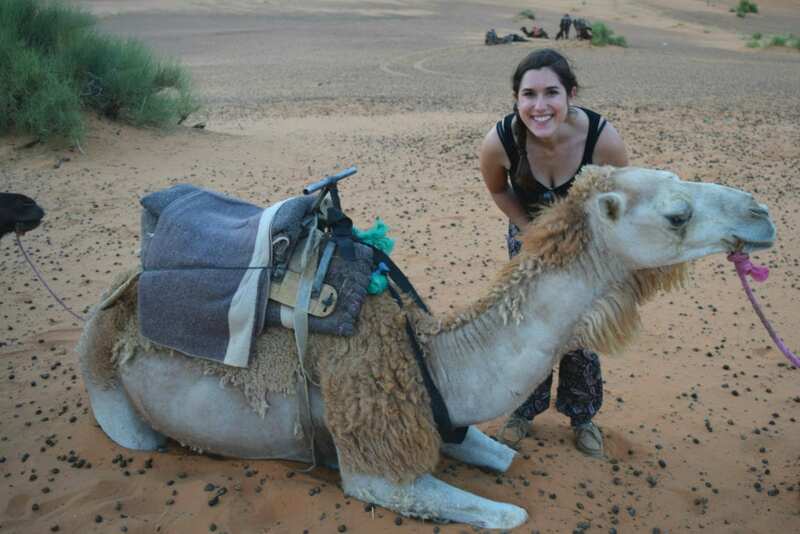 To add to the ambiance, we trekked to our campsite by camel at sunset, and then out again at sunrise. It sounds romantic to do it that way (and it was)–but really, I’m pretty sure the sunset/sunrise schedule has more to do with shielding the tourists from the heat than anything else. Either way, though, the camels definitely added to the atmosphere. Initially, I was a bit disappointed that our 3 day tour only included one to two hours of camel ride, but I quickly got over it–first, because as it turns out that was one to two hours each way, and second, because the similarities between camel riding and horseback riding are somewhat limited. I was so sore by the end of the second ride that I couldn’t wait to dismount. About half our group abandoned the camels entirely on the way back and chose to walk alongside them instead. The camels of the Sahara Desert in Morocco have one hump instead of two, and are therefore technically “dromedaries”, or “Arabian camels”. Everyone in Morocco just called them “camels”, though, either for the tourist’s benefit or otherwise, so I’m going to stick to that for simplicity here. Due to a combination of refusing to close our eyes and stop watching the stars, and being roused at the literal crack of dawn to jump on our camels again and leave (I think it was less than 10 minutes from opening my eyes to sitting on the camel–the Berber boys running this show were incredibly efficient), we barely slept–but it was so worth it. Raving about the desert seems to be a pretty consistent reaction among people who have been there–I really can’t speak highly enough about being consumed by a very different kind of nature than most of us are used to, and I will forever nag anyone who is headed to Morocco to be sure to add a night in the desert (preferably by camel–you can go by 4-wheeler, by unless you have a physical limitation, I don’t recommend it) to their itinerary. … Which begs the question: how should you get out there? 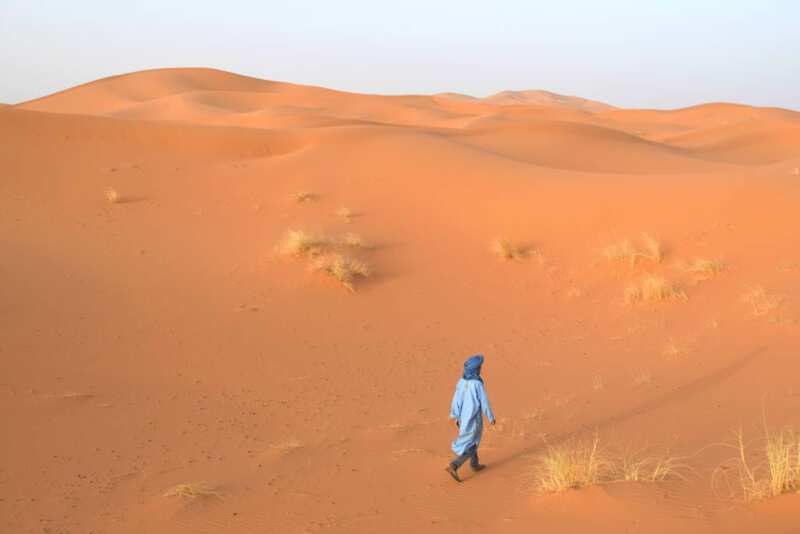 We did a multi-day Sahara Desert Tour in Morocco, but while you certainly need to hire a trekking company to head into the desert for the night, it is possible to get yourself to Merzouga (the “entrance point” to the desert) and find a company there, rather than signing your life away for multiple days. The right answer, I believe, depends fully on your travel style, experience, and expectations. 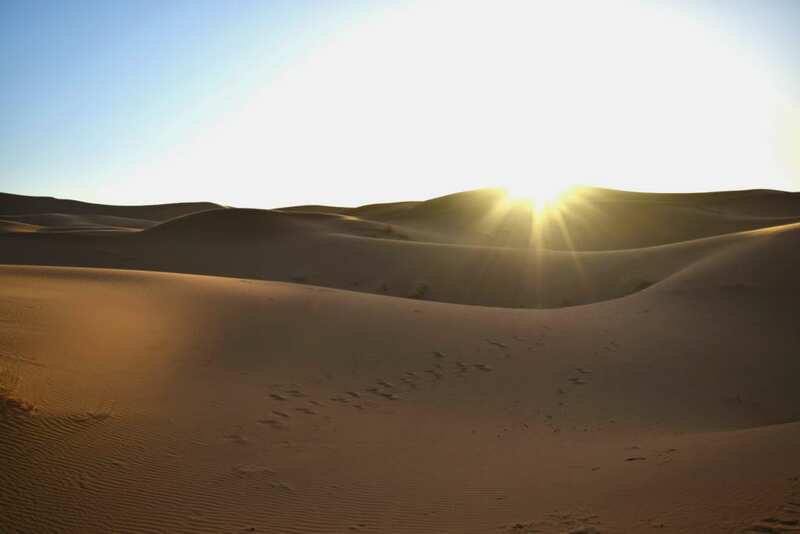 Based on our experience, here are the pros and cons of using a multi-day tour to visit the Sahara Desert in Morocco. It is the simpler option. With a Sahara Desert tour, your transportation, trekking company, lodging, and normally some meals are taken care of in one (negotiated) price. There’s a much smaller chance of getting lost, and there are far, far fewer logistics to manage. Want to make the logistics even simpler? Book a tour before arriving! This popular tour has been reviewed more than 800 times, and follows essentially the same pattern our tour did (most of them do). Yes, you will pay about 40% more than if you haggle well on the ground, but if you’re not on an extremely tight budget, there is something to be said for peace of mind. The group dynamic can add to the experience. Of course, group dynamics can be finicky, but Jeremy and I were lucky enough to end up with a great group of people who all got along well. Those brief “travel friendships” were valuable, and greatly enhanced our experience of both being out in the desert and in Morocco in general. The stops along the way will be organized. This can really fall under both “pro” and “con”, but there’s no denying that the tour bus drivers know exactly where to take you to get some great photos throughout Morocco–some of my favorite photos of our time in the country came from our driver pulling over to the side of a small road and having us all get out to snap. You can be reasonably certain of the safety of your trek. There’s a certain vulnerability in traveling to a country that you’re unfamiliar with, that also has a language that you’re unfamiliar with, that also has completely different customs than you’re familiar with. Though you can never be 100% certain of the safety or reputability of anyone that you’re working with, having a contract with a tour company that delivers dozens of tourists to them regularly does suggest a certain level of experience. You will have little to no control over your schedule. From the moment we were picked up at our riad in Marrakech until the moment the tour was over, we were told when (and where) to eat, when (and where) to spend money, and when (and where) to sleep. In many ways, this is the nature of group travel–but for people who prefer to make their own schedules (guilty as charged), the dynamic can get very frustrating, very quickly. You are a captive audience. Though our tour company did keep to all technical promises made–transportation, breakfast, dinner, lodging and desert trek were covered by our initial fee–the tour company and those working around us pushed the boundaries every way that they could. Mysteriously, we did not eat at one restaurant for lunch that charged less than typical US prices for mediocre cuisine–shocking, I know. We also never ate at a restaurant that had any other stores, restaurants, or general options surrounding it. Our tour group ended up forking over money for a “tour” that we didn’t know that we were taking–and yes, an “any optional entrance fees will be additional” notice was given, but we did not receive any notice when this “optional” activity started and were not given a choice to opt out. Most obnoxiously, in my opinion: on the final day of our tour, half our group (us included) were going to head to Fez rather than bus back to Marrakech. We were told that we would be dropped at a bus station and could then arrange for a bus or a taxi–fair enough. What actually ended up happening, however, was that we were dropped off on the side of the road, no town or bus station in sight, and our bus driver called a “friend” to pick us up before the bus drove away. Of course, we were left with essentially no bargaining power in this situation, as we had no real option but to get in the chosen taxi or be left on the side of the road with our luggage and no transportation. Outside of the Sahara Desert, the controlled activities were mediocre. 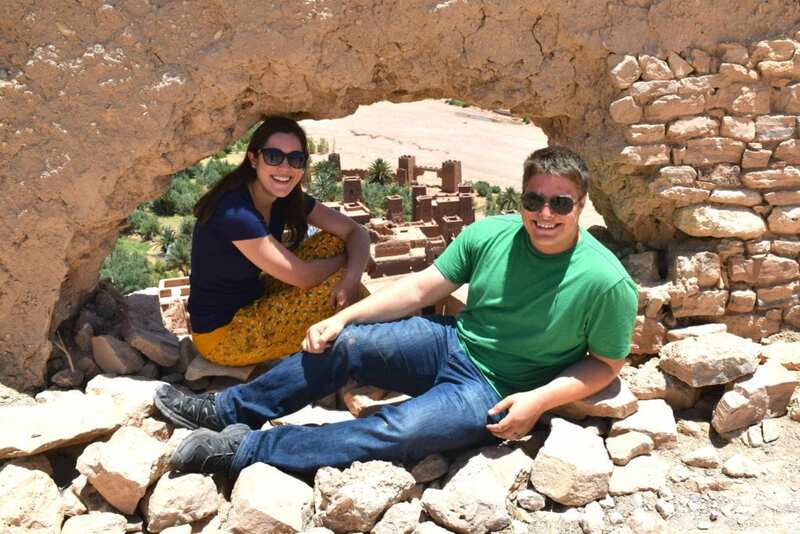 Our visits to Ait Benhaddou and Tinghir were interesting, but they were also very rushed, very formulaic, and were clearly designed to extract money from us rather than provide us with an experience. We stayed in each place for less than 2 hours, with at least 1/3 of that time being dedicated to the clear attempt to sell us things–most obviously, we were taken to a “Berber carpet shop” in Tinghir where we were “shown carpets” for five minutes and “aggressively sold to” for another twenty before we were directed to leave. 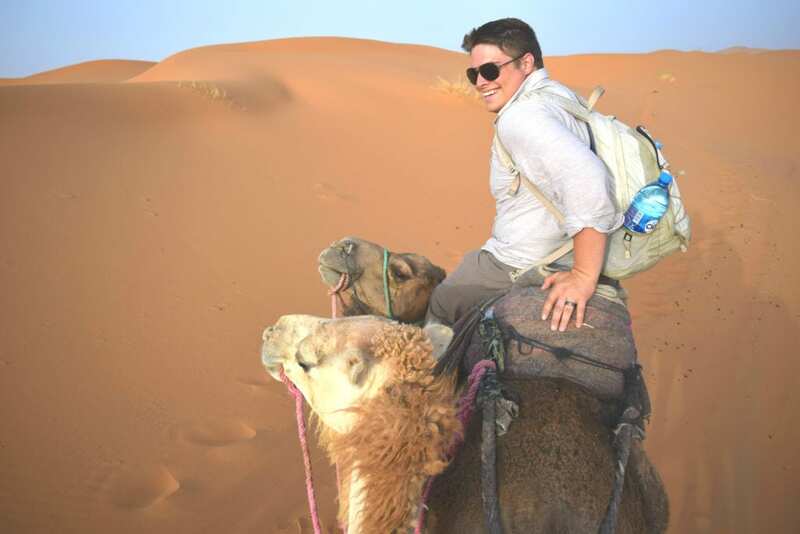 When we took our Sahara Desert tour in 2016, our answer to this question was a hard no: we were traveling on a strict budget, and the easiest way to get the cheapest rates for Sahara Desert tours was to haggle in person. That’s still true, but things have also changed in that time: Morocco has received more and more tourists, and as a result, prices for online bookings have been driven down from absolutely insane (we were quoted well over 300 Euros/person at one point! ), to a more manageable $120-$140 USD for a basic, but reputable tour that looks essentially like the one we took. Yes, that means you’ll still be paying about 40% more than haggling on the ground, assuming you’re a solid negotiator–but there are benefits, as well. While you can never completely guarantee an above-board booking, there’s a safety in booking through a company that already has hundreds of online reviews, and therefore has a reputation (and possibly contracts with booking agents) to protect. This, sadly, goes double for women–in the years since our Sahara Desert Tour, we have met more than one woman who was subject to sexual harassment by their guides. There’s also a logistical ease to planning your trip ahead of time, especially if you know you need to complete your tour on certain dates and plan to make other bookings around that. 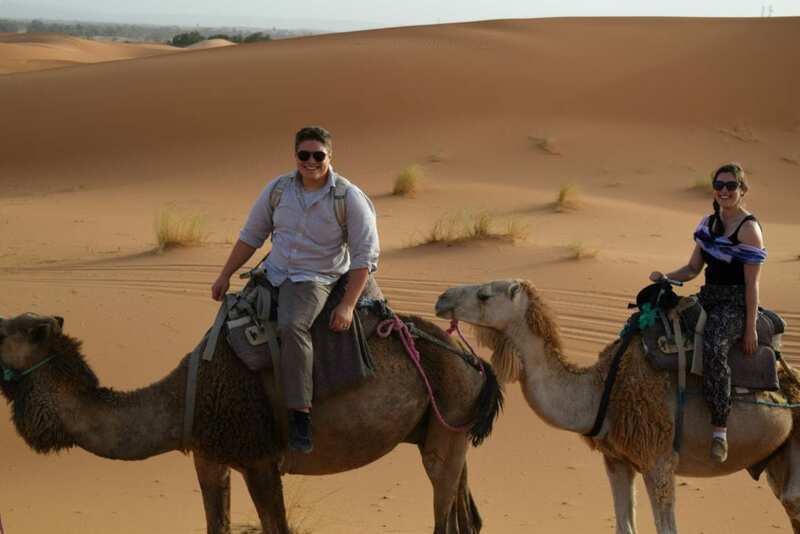 If we return to Morocco in the future with more travel experience, and yes, a slightly larger budget, we will absolutely visit the Moroccan Sahara Desert again–and this time, we will definitely book ahead–probably on this tour, which has been reviewed more than 800 times on Get Your Guide. 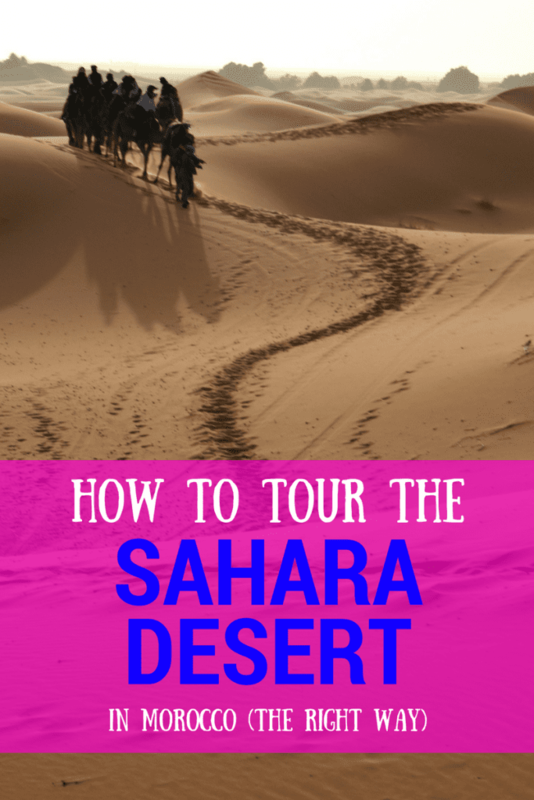 Check reviews & book your Sahara Desert Tour today! I think that we made the right choice by taking a Sahara Desert tour in Morocco. This was our first time in Morocco, and the stress of navigating buses or hiring a car to get to Merzouga, only to find a trekking company ourselves, was an overwhelming prospect that I am glad we didn’t take on. In fact, while updating this post more than 2 years later, I am now more convinced of that above statement (originally written in 2016) than ever–the logistical challenges of traveling independently in Morocco are impressive, especially for people who don’t speak either French or Arabic. At this point, we have traveled to nearly 40 countries, including additional places in Africa, and I am still confident that if we return to Morocco, we would book a tour again in a heartbeat rather than drive ourselves to Merzouga. That being said, the activities leading up to the Sahara Desert itself were definitely a bit of a disappointment, at least the way our tour did them–I would have loved to have had more time at Ait Ben Haddou in particular, and definitely would have preferred to have more restaurant options. A certain amount of that, though, is simply the price of entry to this type of tour–and ultimately, when I look back on our Sahara Desert tour in Morocco, those moments under the stars, nestled against the sand that felt like velvet under a sky holding more stars than I had ever seen, made everything that came before and after absolutely worth it. We are now more than 2.5 years into living nomadically, and our Sahara Desert tour in Morocco remains one of the most memorable travel experiences we have had. If you’re headed to Morocco… don’t miss it. 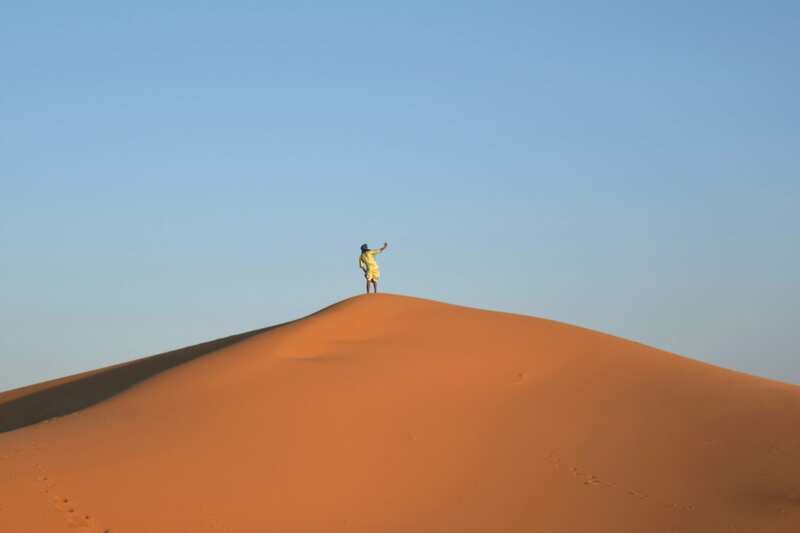 Don’t head out on a Sahara Desert tour in Morocco without travel insurance! We use and recommend World Nomads for their affordability, ease of purchasing & the clarity of their contract! Beautiful pics – I’m looking to do the same in a few weeks! What is a good benchmark price for the 3 day/2 night tour? Are both nights camping or do you do one night in accommodations? Thanks! Oh, how exciting, and thank you! There are a million different companies, so there may be small differences, but we got the impression that the tours were almost identical (our tour group even included people who booked through multiple agencies). Your tour will likely be similar to ours. A good price appeared to be 750 dirham (75 USD). It was the most common negotiated price in our group of 17. Some people paid up to 900 dirham, and a few negotiated as low as 600 dirham. The first night was spent in a hotel, and the second night was camping. We had a private room at the hotel, but camping we were with a few others (several people were told this wouldn’t be the case, including us, so fair warning there). Be sure to bring lots of water–our camp didn’t have any available once we got out there for the night. Have fun!! It’s really such an amazing experience, I’m sure you’ll love it. Thanks for all the advice! Much appreciated. Hello Kate, thank you for all the advice! I keep hearing that booking of a tour to the desert should be done on site. But did you just go through your hotel or looked around? Also, I have read a lot about people who have done a 2 day/3 nights desert trip and would have rather taken a longer one. That’s what I have been thinking of doing, but now that you talk about how you think you would have preferred a shorter trip I am wondering. Do you think you could elaborate on your reasons? Thank you! Hey Alyssa! Great questions. We did go through our hotel to book our tour, but I don’t recommend it–we overpaid because of doing that. 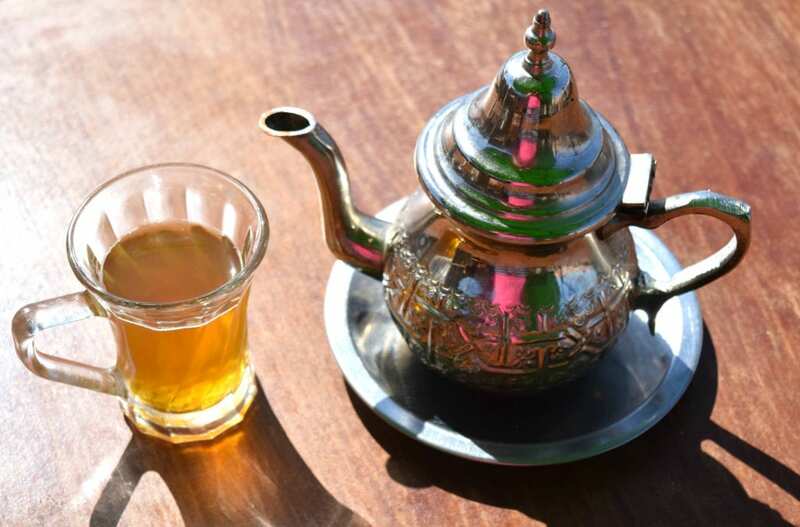 There are several tour companies in Marrakech near the tourist areas, and I would recommend just stopping by a couple of those and haggling until you get the best price. You’ll be going to essentially the same tour regardless (as I mentioned in the post, our tour was made up of several companies bookings), so a fair price is the goal. As far as time, I can certainly see someone wanting a second night in the desert, though we were very sore and exhausted by the end of our time and happy to head back to town. The reason I would have preferred the shorter tour is that rather than extra time in the desert, you’re really paying for the tour companies to take you to extra places with the objective of getting more money from you–very overpriced restaurants, aggressive salesmen in a carpet shop, etc. We did include a couple of the extra stops such as Ait Benhaddou, but not enough to justify taking up more of our time in Morocco for it. Hello, I’ve done a lot of research about going to a Sahara desert camping trip and have learned a lot about it. The one thing no one has wrote about is what to take with you on that part of the trip. How much stuff do the tours usually let you carry with you? Hey Andrey! Our tour company didn’t have us bring anything except a small bag with a camera/contact case/jacket/water in it for the overnight part of the trip. The water was especially important, because there was no water source at the camp. Everything else was left locked in the van overnight. Thanks for your honesty. I appreaciate that the fact that you portray the ‘warts and all’, particularly the carpet shop extravaganzas that put me off travel in the Arab world. Having been in the Amazon, I imagine that the night sky must be something else. Thanks, Gearoid! We always aim for honesty in our writing. 🙂 The night sky really was absolutely incredible–one day we’ll have to go back and photograph it properly! I like your story. I am going alone next month and a little nervous about haggling for a tour once i get there. what company did your tour? Hi Heidi! We’re actually not sure of the company–we booked through our riad, but there aren’t really any specific “companies”. No matter what tour officer you negotiate with, you’ll likely end up in a group with people who booked all over town. The people in our group came from several different agencies! Hi, your blog is awesome in breaking down your experience in Morocco. My husband and I are looking to plan a trip to Morocco in late October. I am so overwhelmed in websites and deciding between booking flights/hotel or utilizing the travel vacation tours. How did you guys maneuver through the process? Thanks again and wonderful site! Hi Kate! Great post! This whole blog is amazing. I’ll be flying in to Marrakesh with a group of 5 of us for 6 days and we plan to visit Fes as well as do a night in the Sahara. My issue is- this trip is part of a much longer 6 week plan so we have quite a bit of luggage (Each with a carry on, back pack and one check in). Because we want to protect our items, do you think it will be a necessity to just pay for a hotel to store our luggage while we venture out for a night of camping? And with that- will they drop us back where we were picked up or will we be transported to Fes like you mentioned with your strange bus/cab incident? We visited Morocco as part of a larger trip too, and we left our large bags locked in the tour company’s van during our overnight (we took our electronics/valuables in our day pack with us into the desert). Hotel storage is a very standard option as well, I would say that both are equally safe–things can always happen, but I don’t think the odds of theft are terribly high. Most tours, including the one we took, return to the city they started in, so you shouldn’t have any problems there! The way we did it was unusual, but not unheard of–we weren’t the only ones to ask to continue to a different city. When do you make your payment? Before the trip or when they pick you up? From the sounds of it, it seems you took all of your luggage with you. Was there any space issues with all the luggage? Sounds sketchy that they just leave you on the side of the road for another car to take you to Fes. Did you have to pay again? How was the tent situation? Was there electricity, blankets, how were the washrooms? I know it usually gets cold in the at night but it will be even colder in december. I’m not a fan of being flocked around to sales pitches, but I do want to see Ait Benhaddou and Tinghir and think this will be a nice way to get a quick glimpse of these places. We paid before the trip, though some people may have paid at pickup. They were totally prepared for all the luggage, it ended up in the back of a van. Yes, the cab to Fes was separate (and yes, a little sketchy too). It’s not required, though–the “official” tour began and ended in Marrakech, but since we and several others were headed onto Fes, we didn’t want to double back several hours. The tents were pretty standard, no floors, cots to sleep on. No electricity. The bathroom is literally a toilet buried into the ground inside another tent, no plumbing. There are luxury camps too, but of course, they cost a lot more. We are thinking of doing a 2 week trip in December/January over the Christmans/New Years break and were also thinking of doing the desert tour en route from Marrakech to Fes. Do you make your payment before, or when they come to pick you up at your hotel? Were there any issues with having enough space for all your luggage on the van? It’s definitely sketchy that they left you on the side of the road for the ride to Fes. Did you have to pay again? Did you go directly to Fes, or make stops on the way? I definitely do not like being flocked around to sales pitches. But I do want to see some of those smaller towns so I might go with the same option. Re: going directly to Fes–it was completely direct minus stopping for gas, snacks, etc. It was just us, the driver, and two other girls from our tour, so if you hired a private cab, I’m sure they’d be happy to stop in any smaller town you like (for a fee, of course). Were most of the options you found 3days/2nights? Or did you see options for 4days/3nights as well? We booked our airbnbs in Marrakech and Fes but have 3 nights in between because we were thinking of doing a 4day/3night desert tour. But it seems like most of the tours leaving daily are 3days/2nights. Just wondering if we should book an extra day with either our Marrakech or Fes riad. The 3 days/2 nights was definitely the most popular version on offer. There were a few people offering 2 day/1 night tours from Marrakech, but that is the only one other than the 3/2 that I remember. I have seen plenty of tour operator websites offer the 4 day 3 night from Marrakech to Fes. I’m sure that literally any of the tour operators would be happy to give you that trip even if it isn’t listed on the website. I’m shopping for tour operators myself and I get the feeling that most of these are either one-man shows or just shell websites that sell the clients to the few bigger companies that exist…. I agree, Zee, the shell companies selling to bigger clients is pretty much what happens when buying in person, too. There are some legit companies out there–I actually think the landscape has gotten a bit better/more competitive online in the last couple of years (I couldn’t find anything less than 200 USD/person in 2016). But, as a general rule for tourism in Morocco, just about anything is possible… for a fee. Have you heard of any experiences of people dealing with bedbugs from these desert trips? I read somewhere that the desert camps might have them. I haven’t personally heard about that from our experiences in Morocco or from fellow travel friends, no–unfortunately, there’s always a small risk of bedbugs while traveling, but I haven’t heard anything to suggest the desert camps are particularly afflicted. How much was the taxi ride from Merzouga to Fes? I am getting some quotes where they will take us from Marrakech to Fes for 135 Euros. I am wondering if it is worth it rather than paying for the ride to Fes separately. Oh gosh–this one sent me back to my notes. We paid $60 USD for the taxi that took us to Fes. It wasn’t from Mergouza directly, they dropped us off at a town maybe an hour or two away? Ok thanks for all the help. I am wondering now if I should pay a bit extra and go for a private tour. Do you remember how much those were going for? I am getting quotes for 250-300 Euros but obviously there’s other that are higher. Private tour without a group? I’ve never looked into the prices for those, but 250-300 sounds pretty reasonable; that would put it about 2.5-3x the price of booking a group tour ahead of time. When you do the 3 day/2 night desert trip starting in Fez, what time of day do you arrive in Marrakech at the end of the trip? Do you recommend the 4 day/3 night or is the first option just as fine. Lots of driving it seems, but everyone says it’s manageable. I am an older mom taking my soon to be 16 year old. Just an update since you were so kind to answer all my questions. We ended up doing a private tour. It was a bit expensive at 260 Euros per person. But it was definitely the highlight of the trip. All the stops we made were very picturesque. The tour guide was spoke very good english and was very knowledgeable and made a lot of stops to take pictures. The place we stayed at the first night was a renovated kasbah overlooking the Dades valley, which was pleasant surprise. We did do shared group tours for day trip excursions to Ouzoud Valley and Essaouira from Marrakech, and it was great for those trips, but I am really glad we did not do a group tour for the desert trip. CAN YOU PLEASE ROVIDE THE CONTACT INFO FOR THE PRIVATE TOUR? Hello, Could you please provide the info for the private tour company you used? What was the duration? A 4 day/3 night option or 3 days/2 nights? Amazing Post! Thanks for sharing and keep up the amazing work. Great article. I am headed on a 2 night / 3 day tour next friday, departing from marrakesh. I have always dreamed of going to the Sahara, but I am nervous that I am trying to shove a lot in to 3 days and it will result in a rushed desert experience and just be mostly the grueling 12 hour drives to and from Marrakesh. Should I wait to do a more leisurely tour at another point in my life? Or should I just deal with the drive and make sure I see it? Can’t decide! The experience cost me $200 USD and I can get a full refund still. If the tour is like ours (most of them follow the same itinerary), it will be pretty grueling, especially before getting to the desert, but the payoff is worth it! 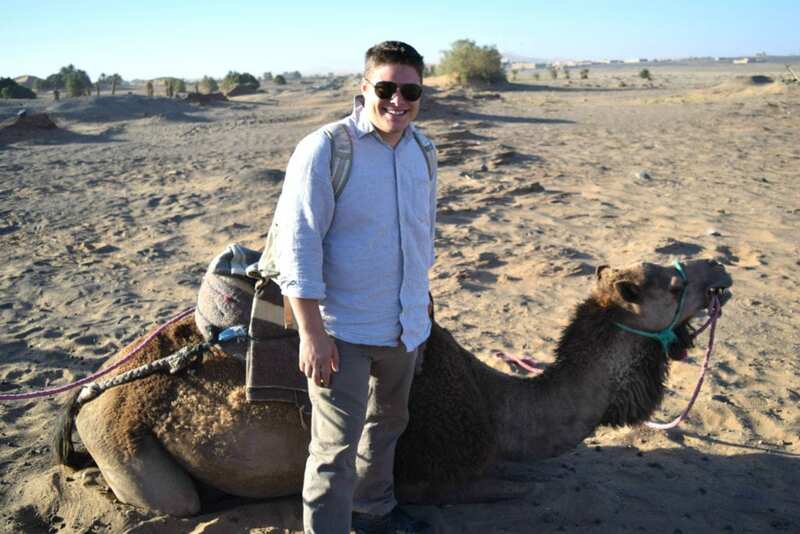 We had two camel rides, one into the desert and one back, each lasting nearly two hours, which is MORE than enough, trust me. We then spent one night in the desert getting the camp experience. That part honestly didn’t feel rushed at all, though of course everyone was exhausted. If you can still get a full refund for your tour, I would suggest shopping around a bit, as $200 USD sounds high–the tour I link in this post is quite a bit cheaper, and if you book in Marrakech, it can be cheaper still (though I don’t necessarily recommend that if you’re concerned about the quality of the experience).